JG sound engineers for a performance of Julia Barber’s “After the Shock” for solo violin and live electronics at the Royal College of Music. Julia’s piece was a prize winner in the BBC Proms Inspire Young Composers’ Competition. 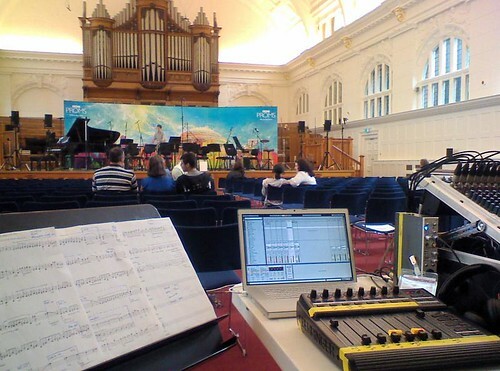 The piece was written during BCMG Electro Sequenza Workshops last year. The performance will be broadcast on BBC Radio 3 at 10pm on 19th August. The BBC provided Meyer Sound loudspeakers. We used a Schoeps CMC64 microphone with a DPA4061 instrument microphone on standby just in case of feedback problems. I used Ableton Live 6 on a Mac Book Pro with an M-Audio Firewire 410 sound card. A Behringer BCF-2000 provided hands-on control.